Babies are very precious bundles of joy and innocence and designing their nursery with a great ambiance for their first series is very essential. It is one of the most special room in a home for the ones who are expecting a baby. A baby’s room is home to many laughs, tears and firsts. It has a lot of countless memories to be cherished by parents. 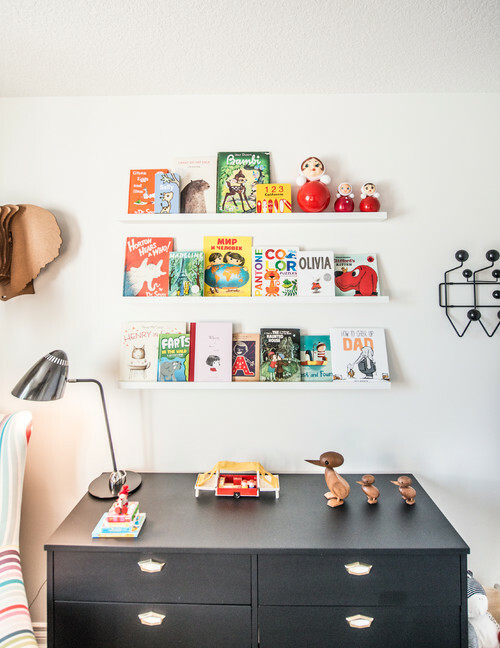 Decorating your little one’s nursery gives you a chance to create a cool and fun room in your home so make use of this opportunity by following one of our ideas after all this is the room where your child life starts in. 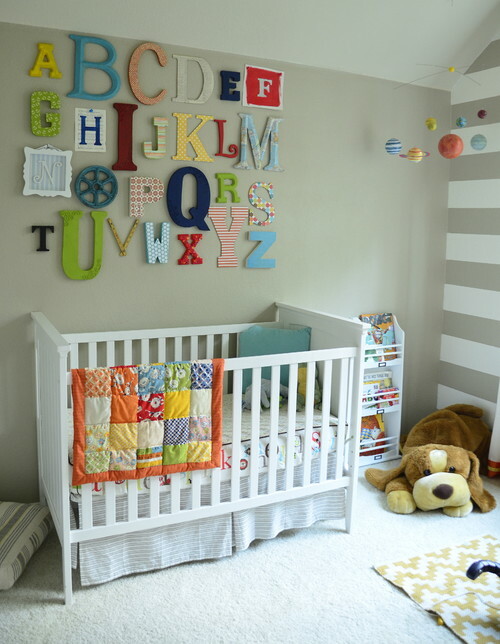 There are so many things you have to think about while designing a nursery for your baby. For e.g. furniture used in the baby room should be handy even when the baby is older. It should be of medium height, neither too high nor too low. One of the first things you would need when the baby comes home is a crib. You can choose the perfect crib (oval or rectangular shape) for your baby or design yourself for the little one. Other things which you would require is rocking chair, toys and dresser to store clothing and for displaying other useful items or you can go for the free standing changing table(to hold things like toys, board games, diapers, towels, baby bath accessories and other small items). So get inspired by these designs and create a space both you and your little one can enjoy and feel comfortable. This one is very bright and colorful. 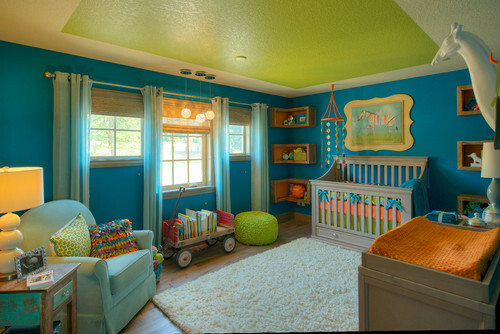 The blue and green combination on walls, to the cozy chair with cool cushions for feeding or cuddles makes this one very beautiful and cheerful room for your baby. The eye catching is the book car trolley which is very interesting and you can tell your baby little sweet stories during their nap time. Love the hanging light as they add a touch of warmth and coziness to the room that is exactly how every child or baby room should feel. While designing the room, you want to decorate one of the walls which could become the limelight of the room and get all attention from your baby and also the other guests who come to visit you. You may decorate the wall by using stencil art, stickers, alphabet patterns either you can go for some large prints, photographs or draw some art on the wall like animal figure or a beautiful tree. 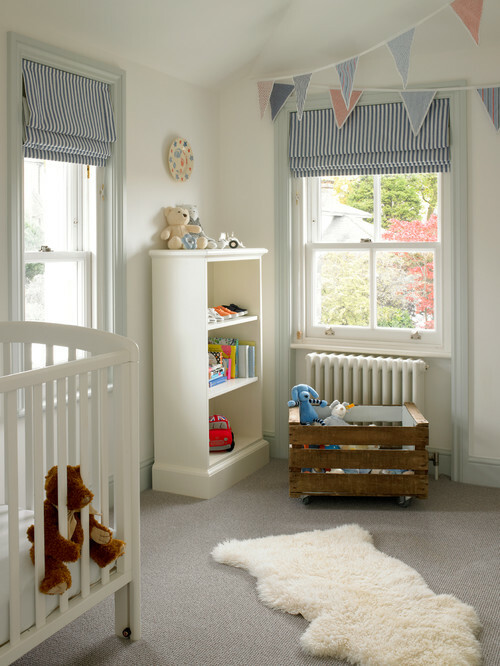 They also create an interesting focal point for your baby as they create a sense of adventure in the room. How cool it is colorful alphabet lettering, it is so visually stimulating and also educational. 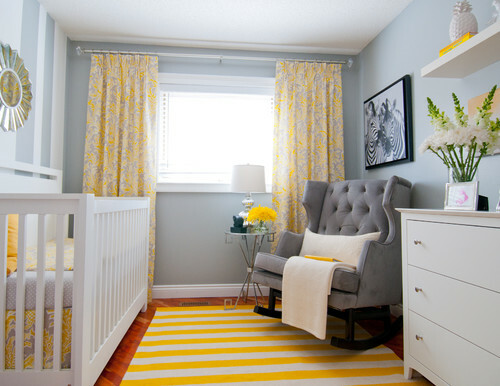 Whether it’s a boy or a girl yellow works well in nursery especially when combining with neutral colors like grey or white. 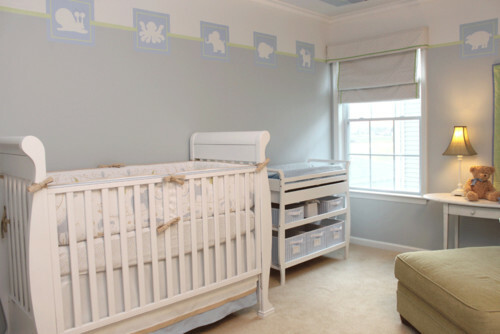 The yellow color makes the nursery very warm, elegant and friendly. For e.g. in this one shade of yellow is been used in rugs, curtains, bedding to brighten up this neutral room. This makes a perfect color palette to ensure a peaceful night’s sleep for the little one. 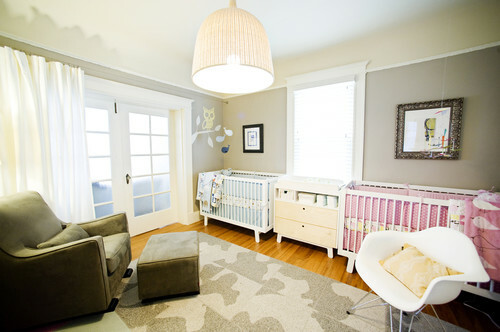 Designing a nursery for not one but two babies can be a more overwhelming task. Like in this one I personally love the calm and cozy feel of this neutral nursery it gives very soothing effect with light and quiet colors, lot of textures on wall and rugs, pretty curtains, drop dead gorgeous central chandelier and the chalkboard notes as wall decorations make this one very ideal and unique for twin babies. For different genders, you can opt for different color cribs like pink for girl and blue for boy and place the dresser or mothers chair in between as it would be convenient for her to manage both. In the end, it’s important to choose a design that is pleasant, comfortable, safe, hygienic and interesting enough to connect with your little one.